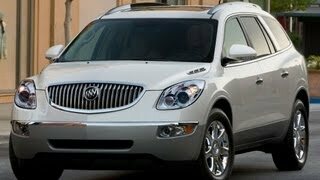 Buick Enclave CXL, the crossover Luxury SUV is a perfect blend between styling and comfort. 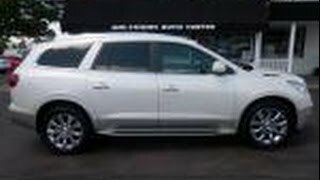 With a seating capacity of upto 8, plenty of cargo space (more than Lexus RX350, Volvo XC90, Audi Q7 and Acura MDX) and 24mpg of fuel economy, its hard to beat with pricing starting at $35,615. 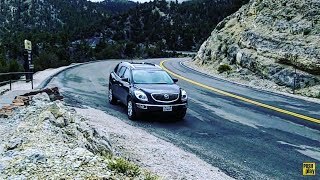 The Buick Enclave combines fuel-efficiency, functionality, style and comfort in a premium crossover that fits up to eight and their cargo. With EPA-estimated fuel economy of 24 mpg highway (FWD), the Enclave provides better fuel economy than a typical eight-passenger SUV. It was the Enclave that first introduced customers to Buick’s product resurgence, and it has succeeded in bringing new buyers to the brand. Despite being generously equipped, it is priced less than luxury competitors and is backed by the industry’s best warranty – a four-year, 50,000-mile bumper-to-bumper warranty and five-year, 100,000-mile powertrain coverage. 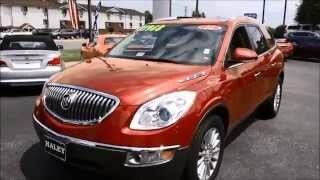 For 2012, Buick Enclave is available in four equipment groups. All-wheel drive is available. The Enclave is roomy,but its fluid lines and curved surfaces create the illusion of a smaller vehicle. Classic Buick design cuesinclude a waterfall grille with a bold, tri-shield emblem and V-shaped portholes. The Enclave interiorcomplements the exterior with a luxurious, warm and inviting environment featuring premium soft-touch, low-gloss materials. Attention to detail is evident in thefit and finishof all interior elements including the instrument panel. 20-inch chrome wheelsare available with the premium equipment group. Enclave is the only crossover in its segment equipped withQuietTuning, Buick’s exclusive engineering process designed to reduce, block and absorb unwanted noise from entering the cabin. Even with three rows of seating, Enclave stillprovides 24.1 (682 L) of cargospacebehind the third-row seat when the cargo management system is removed. That’s the trunk capacity of some large sedans and room that many crossovers cannot match. Enclave offers 115.9 cubic feet (3,282 L)of cargo space behind the first row when the second- and third-row seats are folded. The second-row seats feature theSmart Slide system, a popular feature that allows easy entry to the third row with the pull of one handle. A second-row, 60/40-split bench seatand power sunroof are available on all models. Bose premium audio systemis available on 1SB, 1SD and 1SL packages and standard on the premium equipment group. A Driver Confidence Packageconsisting of remote start, rear park assist and rear vision camera is standard on 1SD, 1SL and 1SN packages. The Leather Packageis standard on 1SL and 1SN and includes leather seating, front heated seats, and seat adjuster upgrades for the driver and front passenger. The Premium Packageadds cooled seats, articulating headlamps, power tilt and telescopic steering wheel, power folding outside rearview mirrors, 19-inch chrome wheels and the Bose premium audio system. A second-row console, rear-seat DVD and navigation systemare available on 1SL and 1SN equipment packages if equipped with the Bose audio system. The Enclave’s carlike driving experience comes from its stiff structure, purpose-built suspension and aerodynamic shape. Variable-effort power-assisted rack-and-pinionsteering is supported by independent front and rear suspension designs. The front suspensionfeatures a MacPherson strut design, with a direct-acting stabilizer bar that helps provide a more immediate feel during turns. An available, intelligent all-wheel-drivesystem provides full-time function. The system automatically decides how to distribute torque based on vehicle speed, throttle position and individual wheel slip, and it is integrated with the electronic traction control system to provide outstanding capability in inclement weather. A trailering packageis available on all models. Powering all Enclave models isa fuel-efficient 3.6L direct injected V-6 engine with variable valve timing that blends power, smoothness and efficiency for an SAE-certified 288 horsepower (215 kW) and 270 lb.-ft. (366 Nm) of torque. Because thedirect injection enginesprays fuel directly to the combustion chamber to create a more complete burn of the fuel/air mixture, less fuel is required to provide the equivalent horsepower of a port-injection combustion system. EPA-estimated fuel economy is24 mpg highway on FWDmodels and 22 mpg on AWD models. The 3.6L V-6 engine is mated to the Hydra-Matic 6T75 electronically-controlled six-speed automatic transmission. The Enclave can tow up to4,500 pounds (2,045 kg) when properly equippedand can be flat-towed in both FWD and AWD configurations. The Buick Enclave provides safety technologies designed to protect passengers before, during and after a crash. The 2011 Enclave achieved highest-possible federal crash test ratings and was named a top safety pick by the Insurance Institute for Highway Safety. Standard four-wheel-disc brake systemfeatures smooth, quiet operation, longer pad life and more resistance to brake pulsation. LATCH (Lower Anchors and Tethers for CHildren)child seat attachment system is standard. A Panic Brake Assist featuredevelops additional brake pressure when an emergency braking situation is detected. Enhanced structure to absorb crash energyprovides a protective “safety cage” around occupants..